1. Wash the watermelon. Using the round seedless watermelon, cut a ¼ inch slice off the bottom to provide a stable base. 2. Cut the melon 2/3 from the bottom and about 4" away from the front, then slice down to detach top. See picture below for an easy reference. Place this leftover rind piece to the side for later. 3. 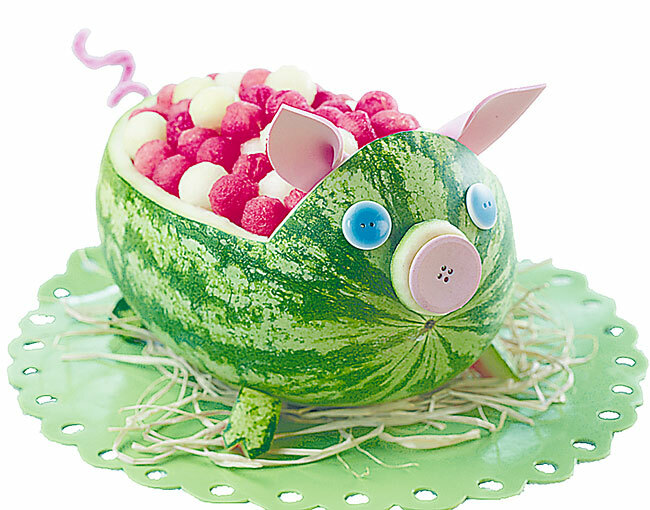 Use a melon baller to cut out melon pieces from the inside of the main piece and place aside in a bowl. Gently scoop out remaining watermelon bits to create a clean "bowl" for serving the watermelon balls. 4. Coil the pipe cleaner to create the tail, and cut ears from the pink foam craft sheet. You can also use a small circle of the rind for the snout, and if you prefer, top with a large pink button. Cut a small circle to mount the snout on from the leftover rind piece. Attach the tail, eyes and snout with straight pins or toothpicks. 5. To make the pig hooves, cut four square shapes from the leftover rind piece. At the bottom of each square, make a triangle cut to define the hoof. Attach the hooves with toothpicks or pins. 6. Fill the bowl with the melon balls. Try adding other fruits or berries for more color and enjoy! Please email: info@watermelon.org for a How-To Sequence Photo for this carving.